SAN DIEGO – The Grossmont College Griffins have a bevy of offensive stars that have given scoreboard operators fits all season. But Griffs freshman right-hander HAYDEN SHENEFIELD kept the tote down Thursday afternoon at San Diego City College in his first collegiate start, striking out 16 Knights in a 2-0 Pacific Coast Athletic Conference shutout at Morely Field. Shenefield, who pitched as a senior at El Camino Real High back in 2013, allowed just three hits and walked none to immediately insert himself into Grossmont’s pitching plans for the remainder of this notable season. The Griffins would get all the run support Shenefield would need in the second inning on a single through the right side by TREVOR BEARD, which scored JUSTEN BURKEY and ERIC DE LA ROSA. It was a rare below-par day for the Grossmont lineup, thanks to former Valhalla High hurler GARRETT YOCUM. Yocum was very good in a complete-game effort, in which his record dipped to a hard-luck 2-8. It was one of his best performances of the season, as well. The sophomore allowed just the two runs on five hits, while striking out 5 and walking four. But the day belonged to Shenefield. The 6-foot, 165-pounder displayed a high-strikeout rate for the second time in a long outing. 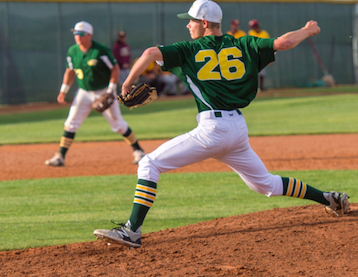 After making just one appearance in Grossmont’s first eight games, Shenefield worked his way into a role with six-straight scoreless outings during the team’s 10-game winning streak last month. He got stretched out in a long-relief spot in a blowout of Mesa back on March 20, striking out nine over five innings. After picking up a save on Tuesday with an inning-and-a-third of relief in a rare Griffins’ close game, Grossmont coach RANDY ABSHIER gave the former Conquistador reliever the spot start and he responded with the startling performance. Shenefield struck out every Knights’ batter except one at least once. Two hitters, he K’d three times. Grossmont rode the effort into their sixth-consecutive win. Grossmont is 16-1 in conference and 21-6-1 overall. It was the Griffs’ first complete game of the season from the pitching staff. Shenefield lowered his ERA to 1.55 this season. That keeps them 1 1/2 games ahead of second-place Palomar, which is whipping through league play as well, currently tallying a nine-game win string. Grossmont and City (7-7 PCAC, 12-13) conclude this week’s series on Friday back at Mickelsen Field at 2 p.m. The Griffins play a pair of non-conference games next week (home vs. West LA and at Long Beach) in preparation for the big series with the Comets April 18, 20 and 22. Grossmont has the luxury of playing two of the three at home. The Grossmont College baseball team announced on Wednesday that 5-foot-10, 215-pound Burkey had verbally accepted a scholarship to Clarke University in Dubuque, Iowa. The NAIA Crusader program, soon to be renamed Pride, is currently at a high point of the history of the squad, currently sporting a 27-6 mark record and is ranked 11th in the country after last year’s all-time best 38-17 under fifth-year coach Dan Spain. Burkey attended San Pasqual High School. Trevor Beard singled through the right side, 2 RBI; Michael Diff advanced to second; Eric De la R scored; Justen Burke scored.